My little town, famous for being the "small town in mass society" is hopping on the bandwagon to support gas-fracking. No. Let me clarify: the town board has proposed a resolution to support a private corporation in another town to drill a well and frack it with highly explosive propane. PLUS- you can use the propane when it comes back out with the gas. Sounds ideal. But here's the problem: fracking with propane isn't any cleaner or less polluting than fracking with water. And it won't produce a lot of local jobs. According to Dr. Ron Bishop, a professor at SUNY Oneonta, using propane to frack wells "wouldn't deal with some real technical challenges." In order to suspend the sand or other proppants used to hold open the fractures, liquid propane needs to be thickened - so foaming agents will need to be added. Fracking crews will also need to add corrosion inhibitors and biocides, too. Then there are some new problems, such as controlling a pressurized liquid that quickly turns to gas, and the use of a fracking agent that itself is a greenhouse gas that contributes to climate change. And gas-fracking does nothing to solve the toxicity of deep brines that flow out of the gas well bores - the brines that, in Marcellus shale, bring up radioactive elements in addition to salts. So there's still the issue of waste disposal. Dr. Tony Ingraffea, engineering professor at Cornell, has his own list of problems with gas-fracking. In addition to using large quantities of chemicals, gas-fracking requires compressors at the drill site to re-condense returned propane for reuse. The process is so fraught with danger that the gas-fracking process is now "nearly robotic" because of risks to personnel on the well pad, he says. Then there's transportation. Instead of trucking water to frack jobs, trucks will be transporting hazardous material. Once downhole, pressurized propane can still migrate back to the surface (and to water wells) via faults and abandoned wells. So can any chemicals used with the propane, and methane released from the shale. That means that drinking water supplies are still at risk. An added danger of propane is that it is heavier than air, and can pool in low spots near the well pad in large amounts, causing an explosion hazard - not to mention an air quality hazard to neighbors. Add to that, the only substantive information about the gas-fracking process comes from the company (GasFrac) - there has been no independent empirical analysis of the complete process. 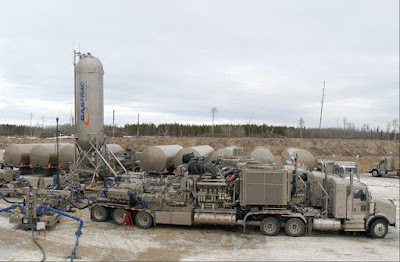 The bottom line, says Ingraffea, is that "no science is available to evaluate either the environmental impacts of LPG fracking or the safety thereof." Supporting gas-fracking, he says, is nothing more than grasping at straws for a solution to problems the industry claims don't even exist. So, why is my town board so gung-ho to support gas-fracking? We don't even have a horse in this race... but read on for some insight into how small town politics works. Back in June the DEC finalized their years-long study of hydrofracking and determined that, no, it was not gonna happen. Some landowners, believing that they have untapped mineral wealth beneath their feet, decided that there was more than one way to extract fossil fuels from the ground. So in early July, a handful of farmers formed "The Snyder Farm Group" and filed an application with the NY State Department of Environmental Conservation (DEC) for a permit to fracture shale using gelled propane. It's not high volume hydraulic fracturing, said their lawyer - so DEC should be able to allow it under the 1992 Generic Environmental Impact Statement (written before gas-fracking was born). At the last board meeting (September 8), the town board and the town planning board got into a heated discussion about language regarding fracking in the proposed revision of the Comprehensive Plan. “We’re not opposed to fracking, just fracking carte blanche,” said planning board member Art Cacciola after the meeting. The next town board meeting will be Tuesday, October 13. It promises to be interesting, as the board intends to vote on the Comprehensive Plan (and maybe change the language to include fracking) - and may, or may not, vote on the resolution written for them by the Snyder Farm Group. Agenda should be posted here prior to meeting. 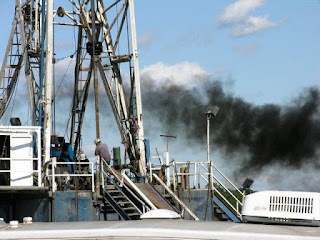 A new study finds that air pollution from industrialized drilling and hydrofracking can likely travel hundreds of miles, even to states with little or no drilling. 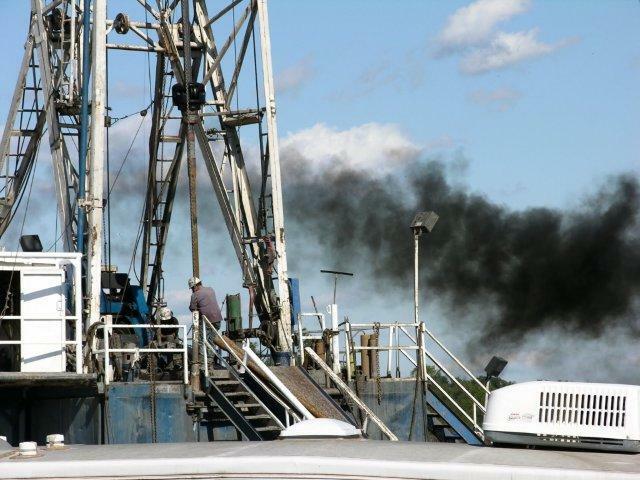 The study, published in the June issue of the journal, Atmospheric Environment, shows that emissions associated with hydraulic fracturing and shale gas operations could be polluting air in cities far from the drilling pads. Scientists from the University of Maryland looked at levels of ethane in the air of Baltimore and Washington DC. They used hourly measurements of volatile organic chemicals (VOCs) from Photochemical Assessment Monitoring Stations (PAMS) in the Baltimore and DC areas. The PAMS don't collect data on methane but they do measure ethane, which can be used as a tracer for fugitive natural gas production emissions. While composition varies from site to site, ethane makes up a significant portion of gas produced from Marcellus shale. Analyzing data collected between 2010 to 2013, the researchers noticed that "daytime ethane concentrations have increased significantly since 2010, growing from around 7 percent of total measured nonmethane organic carbon to around 15 percent in 2013." It is important to note that neither Baltimore nor Washington DC have fracking operations in or around their metropolitan areas and, until late last year, the state of Maryland did not allow fracking. So where did this air pollution come from? The trend in increased ethane, say the researchers, appears to be linked with the "rapidly increasing natural gas production in upwind, neighboring states, especially Pennsylvania and West Virginia." They compared the Baltimore/DC data with a control site outside of Atlanta, GA, a region without new, widespread gas drilling operations. The PAMS site in Georgia did not show the same trend in increased methane as seen in the northeast. The scientists conclude that the increasing amount of ethane in the air indicates that "a substantial fraction of natural gas is escaping uncombusted" and traveling downwind. As shale gas production expands, this trend will continue in downwind regions, they say, noting a disappointing trend in regional air quality. Also, this observable increase in ethane corresponds to a regional increase in methane - a critical greenhouse gas.